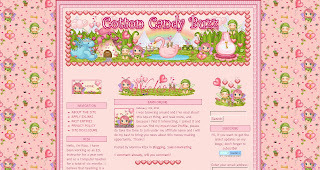 All that is sweet and colorful and cheerful in life you can find at Cotton Candy Buzz. Have you ever seen a blog layout so colorful and sweet and full of winged-fairy goodness? This is my first time and I love the experience! I feel like I am floating in the air with the tiny winged creatures, just the layout itself made me feel in love and evokes in me that cheerful feeling. The blog layout was successful in making the reader feel that. I love how the author was able to optimize the color of the texts against a colored background... it does not give you a headache at all. The three-column layout is very organized and all the essentials: about page, archives and categories are in place. It is so very easy to navigate too! Amen to that! The blog's author is Riza, a work-at-home mom to two kids and an ESL (English as a Second Language) Instructor. She writes on a variety of topics, with blogging taking the front seat. You will find her writing about parenting, motherhood, health and wellness, personal growth and other subjects too. Despite the fact that she opened her blog to product reviews, she maintains that policy that she will only do so if the companies or individuals that she will promote produce quality items and excellent services. Now that's what I call honest advertising. Looking to have your product or service reviewed? Or do you simply just want to read about something useful and cheerful? Then I recommend that you visit Cotton Candy Buzz. hehe... blog and have candy in mouth! shop online so easy now! I love candy and I easy get toothache too!